This is a bit of a departure from my usual multiple rhymes/songs to use with the same set of felt pieces....instead, I have multiple props for the same song. 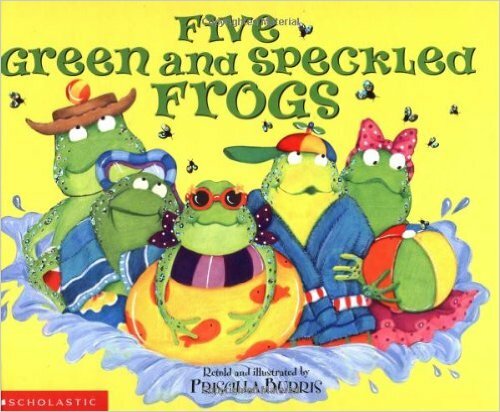 "Five Green And Speckled Frogs"
Eating the most delicious bugs - YUM, YUM! Where it was nice and cool. 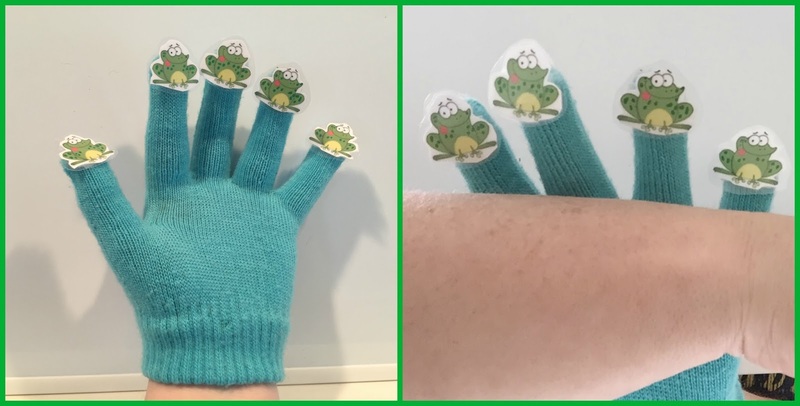 Then there were four green speckled frogs - RIBBIT, RIBBIT! (1) First, I started with a traditional set that could be made from felt, but I was pressed for time so I chose craft foam since it is easier to work with. First, I cut the frogs out using an Ellison die, then cut the log and pool out freehand, and quickly added details with markers, some pre-made foam bug stickers, googly eyes (because googly eyes always make things better), and magnets on the backs. (2) Next, I made this quick and easy tube story that I first saw at Miss Meg's Storytime, using free printable clipart she suggested from My Cute Graphics. First I scaled the frogs to slightly less than 2" wide, printed, and cut out. Next, I cut out a wavy strip from blue construction paper and attached it to a piece of brown paper, then cut into 2-inch wide strips. Then, simply wrap the strips around a paper towel tube and staple as closely as possible. I put a staple in from each side, far enough in that the frogs would cover them once glued on. See the in-progress photo above. Then I drew some "most delicious bugs" and added some speckles and log details (which I had forgotten to do before I took these photos). So as each frog jumps into the pool, simply flip it down. Easy peasy! (3) For the third way, we happened to have a bin of these plastic, jumpy frog toys, and I was able to find 5 that were green and had speckles on them. Luckily, I had a scrap piece of wood at home that still had bark attached to serve as the log, and I re-cycled the foam pool from above. These frogs don't really jump forward very well, they mostly just jump up, so it works best to have them slightly elevated above the pool so they can just jump and fall into it. (4) For the fourth method, I made a homemade storytime glove using an old glove I had laying around. I simply found some cute clipart frogs, scaled them down, printed, and laminated them. Then I just used scotch tape loops to attach them to the glove. I've used this same method before to make a "Five Little Bees" glove with its mate, and the tape holds surprisingly well! My other arm serves as the log, conveniently freckled and speckled! (5) Then for the fifth and final way, the book! There are several different versions out there, but the one we have at my library is by Priscilla Burris. The hardback is out-of-print, but Scholastic is releasing a board book version in June (2016). Enjoy! These were all really quick and easy to make. The hard part is getting the song out of your head! To see more Flannel Friday posts from other bloggers, go to this week's Flannel Friday Round-Up hosted by Kathryn at "Fun With Friends At Storytime", or visit the Flannel Friday Pinterest board for tons of inspiration. For more information about Flannel Friday and how to participate, visit the Flannel Friday site. Come back here next week, as it will be my turn to host the Round-Up! Thanks for sharing Jen! I have not yet used craft foam to make story pieces. How do you get them to stick to the flannel board? P.S. My Cute Graphics is the best! I just attach magnets (either hot-glue or self-adhesive)to the backs and use the magnetic board (I have a reversible board that is flannel on one side and magnetic white board on the other). Other people have said they attach velcro dots to the back to use them on a flannel board. Hope that helps.